I never can quite get over the joy that I get to experience when I capture a family during their maternity session and I later get that text that their sweet baby has finally arrived. It's this connection I get to create with a family that means the world to me and I feel an instant connection to baby as soon as he or she comes Earth-side! Sweet little Aubrey was no exception. That text message of her sweet little face just moments after her arrival absolutely made my heart sing knowing she and mama were safe and that I would soon get to meet her since seeing her in the belly. She was just the sweetest little girl and the first girl to the family so it was so fun to celebrate her and put some majorly girly twists on her session like big flowers and lots of pink! 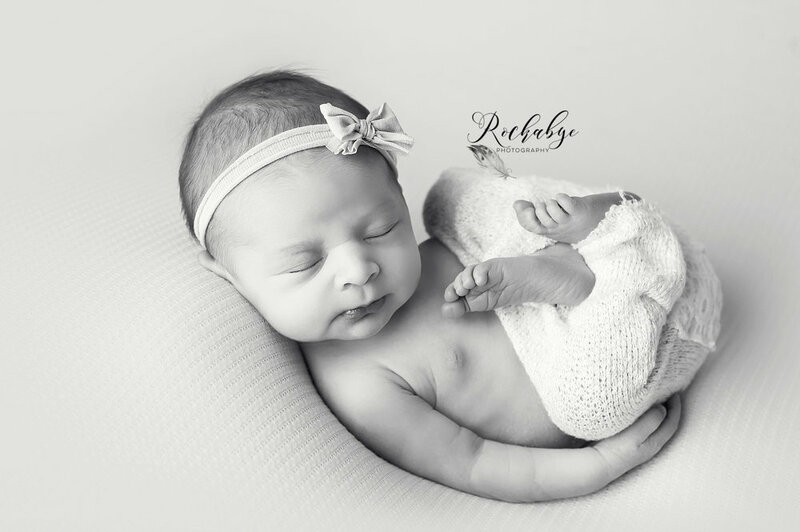 Rockabye Photography is a full-service, fine art photography studio specializing in newborns, maternity, & baby's first year milestones. With heirloom, fine art products that will last a lifetime and an experienced, loving artist to offer the most unique experience in the area, I hope to work with you! Please check out more of my work on my website or visit my social media to see what I'm doing daily!